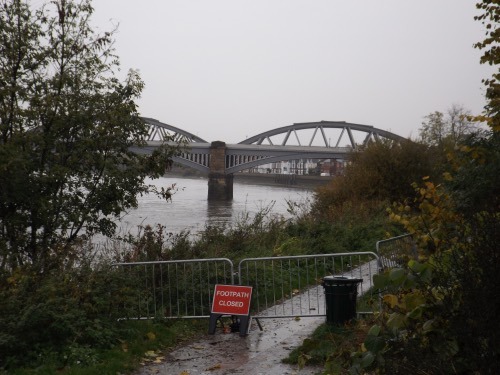 There is a temporary towpath closure for works between Barnes Railway Bridge and The White Hart at the start of Mortlake High Street in London. Walkers must follow the road as far as the pub. The path improvement is just one of many planned changes in the area. There is a scheme to turn the upstream side the railway bridge into a ‘garden bridge’. This has the support of councils on both banks and Network Rail. The local claim is that this will not cost very much unlike the one being resisted by City and Waterloo residents in central London. Just after The White Hart, the towpath runs below the large windows of The Depot restaurant. Next year this will be a Rick Stein restaurant. He recently opened a branch at Sandbanks on the Bournemouth Coast Path. A few yards further on the path passes over the Mortlake Brewery drawdock. This is where Watney’s Red Barrel was produced and more recently Budweiser. Brewing began in 1700 and ended last December. The riverside site with Victorian buildings is now due to be redeveloped for housing. The Ship, almost as old as the brewery and once the University Boat Race finishing post, survives. It is also now a community toilet point.